Just in time for summer, Emily Carpenter delivers everything needed for the perfect beach read. 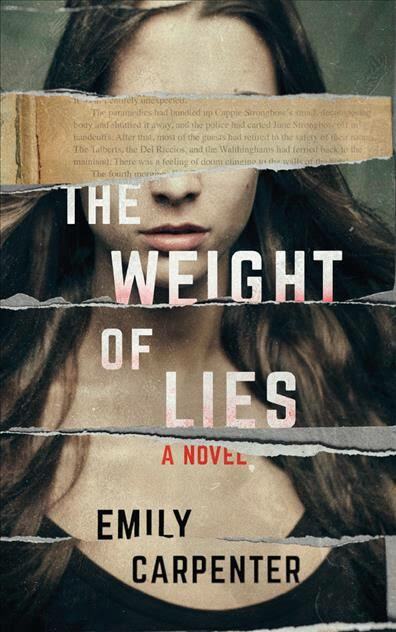 A book within a book, The Weight of Lies delivers a modern day thriller exploring mysteries from the past interwoven with passages from a horror novel which only enhances the suspense. Meg Ashley hates, but is beholden to, her mother. Frances Ashley is a well-known horror writer whose fame allows her to lead a glamorous, jet setting life. Her wealth has given Meg a very comfortable lifestyle as well. This fame has also kept Frances from being an attentive or even engaged mother- unless the press is around. Meg was left to a life of nannies and prep schools. Now twenty-four years old, Meg has not spoken to Frances in three years. Not since the biggest blowout of their tumultuous relationship. An elegant invitation finds her hiding in Las Vegas though, and Meg is drawn back into her mother’s sphere. But it is not Frances’ birthday party that makes her relent. Her mother’s agent, Edgar, has been the closest thing to family Meg has ever known and a note on the invitation urging her to come because he is ill is too much for Meg to ignore. Disappointment awaits, but that is also where the story really begins. At the party, Meg is urged by her mother’s assistant, Asa, to write a celebrity child tell-all. Full of a new sense of anger, she agrees. A straightforward mother-daughter memoir does not seem like enough though. Meg also decides to investigate the other, perhaps more important, relationship in her mother’s life- her infamous novel Kitten. For years, fans, collectively known as the Kitty Cult, have tried to unlock the secrets surrounding the actual murder on Bonny Island, GA that inspired the book. What unfolds is a complicated story of relationships, hidden lies (as the name suggests), and unexpected truths. Larger issues like race and belonging elevate this to a more engaging and intriguing read than thrillers sometimes offer. The mystery of what happened on Bonny Island years before is the story, but the Cherokee people, the marginalized people of the community, are the heart of it. Carpenter also allows her characters to really develop and reveal themselves in the context of these larger ideas. Almost as important to the story as the plot, the atmosphere Carpenter creates envelopes the reader. Dripping in southern gothic, an isolated island and an old mansion turned hotel, long faded from its former glory, set the tone. These locations are key to the feeling of being out of time, even as the story takes place in our technical, connected world. Chapters from Kitten are interwoven with the present day, setting up the tension and adding to the sense of connection in time. As both tales reveal themselves in parallel tellings, the truth bears out through very meticulous storytelling. There is not a lot of telegraphing or large hints to give this one away. Reviewing a good mystery without giving too much away is difficult, especially one with as many twists as The Weight of Lies. Cliched phrases like “page-turner” and “edge of your seat” certainly apply, but the story is more finely crafted than all that. Fans of suspense or just finely crafted fiction will find Carpenter’s second outing an addicting read- they might even lose some sleep over it as I did.